New York, N.Y. : Scholastic Press, 2013. 260 p. ; 22 cm. Based on the life of Jack Gruener, this book relates his story of survival from the Nazi occupation of Krakow, when he was eleven, through a succession of concentration camps, to the final liberation of Dachau. 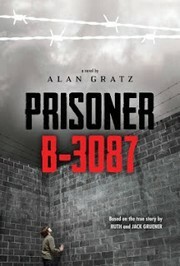 Prisoner B-3087 / by Alan Gratz. "Based on the true story by Ruth and Jack Gruener." "While the story of Jack Gruener is true--and remarkable--this book is a work of fiction. As an author I&apos;ve taken some liberties with time and events to paint a fuller and more representative picture of the Holocaust as a whole."--Afterword. $c Statement of responsibility by Alan Gratz. 250 Edition $a Edition statement 1st ed. $c Date of publication, dist, etc 2013. 500 General Note $a General note "Based on the true story by Ruth and Jack Gruener." 500 General Note $a General note "While the story of Jack Gruener is true--and remarkable--this book is a work of fiction. As an author I&apos;ve taken some liberties with time and events to paint a fuller and more representative picture of the Holocaust as a whole."--Afterword. 500 General Note $a General note Includes a biographical afterword. 520 Summary $a Summary, etc. note Based on the life of Jack Gruener, this book relates his story of survival from the Nazi occupation of Krakow, when he was eleven, through a succession of concentration camps, to the final liberation of Dachau. $v Form subdivision Juvenile fiction. 655 IT:Genre 7 $a Genre/form data or focus term Biographical fiction. $2 Source of term gsafd.